As Exercise Griffin Strike 16 activity ramped up on Salisbury Plain Training Area (SPTA) in April, more than 5,000 British and French soldiers of the CJEF (Combined Joint Expeditionary Force) are putting their combined training to work through three major scenarios demonstrating their interoperability in the field. Exercise Griffin Strike, the culmination of six years of joint exercises and interoperability tests between the British and French military, is the validating exercise bringing the land, air and sea components of the CJEF concept together in realistic scenarios with French armoured vehicles, UK aircraft and airborne forces and infantry, armoured personnel and medics from both countries. Major General Patrick Sanders CBE DSO, General Officer Commanding 3rd UK Division and Commander of the CJEF’s British land component, said “The CJEF has a set of roles which range from conducting crisis management through to non-combat, evacuation operations and humanitarian assistance; at the most demanding end, limited intervention operations and peace enforcement. Representing the French land component of the CJEF, Capitaine Victorien of 1er Regiment de Tirrauliers and Commandant of SGTTA (Sous-Groupement Tactique Interarmes), said “We have been training with British troops to improve our interoperability in order to validate the concept of CJEF. The first scenario for the exercise sees a Combat Service Support (CSS) squadron from 101 Logistic Brigade and a paired tactical group based on 516 Regt du Train work together to retrieve a bomb-damaged Warrior Armoured Fighting Vehicle. Recovery and medical assets move in to support as the scenario unfolds, with a French armoured recovery vehicle recovering the Warrior. A simulated casualty evacuation from the field by the troops demonstrates how French and UK medical personnel train together using each nation’s equipment and protocols to successfully treat a range of casualties. The availability of different medical platforms and the integration of clinical teams prove that regardless of nationality all are able to work across bi-national teams, ensuring streamlined, effective care from point of wounding to a role 3 hospital environment. A combined attack on a village started with C Company, 3rd Battalion The Parachute Regiment jumping in from an RAF C-130 Hercules to occupy a blocking position. The paratroopers take up positions on a ridge overlooking the village to prevent enemy forces retreating. Apache attack helicopters from 3 Regiment Army Air Corps then strafe enemy positions ahead of an air assault to capture a key bridge on the route to the village. A Company, 2nd Battalion The Royal Gurkha Rifles swoop in on two RAF Chinook helicopters. They will overcome enemy positions defending the bridge and then fan out to provide a secure perimeter. With the approach to the village secured, VBCI armoured personnel carriers and Leclerc main battle tanks from 1er Regiment de Tirrauliers stream across the bridge and into battle. The final scenario sees an all-arms group seizing a village (Imber, for the purpose of setting the scene). With the break-in point to the village secured, three infantry sections, reinforced with combat engineers, one tank and a joint fires controller, push in. Close ground limits the space available for fire and manoeuvre, which is a defining feature of combat in urban environments, placing a high level of autonomy on the platoon and troop commanders. Armoured vehicles and dismounted troops arrive and progress under cover of a smokescreen. Three key principals for sections moving in an urban environment are strictly monitoring arcs of view, correctly grouping assets to meet the threat and coordination at crossing points. Following set drills working with the armour, the dismounted infantrymen close with and secure their objective safely. 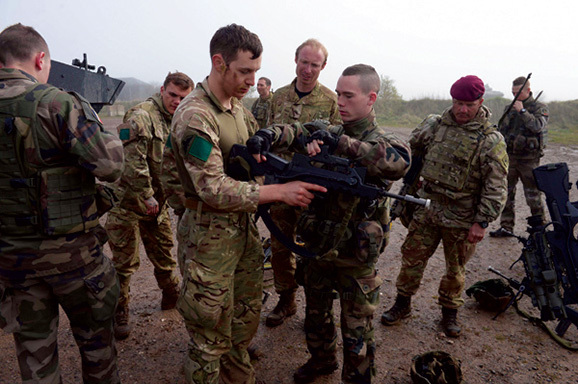 Following a demonstration of the fast-paced live scenarios, Maj Gen Sanders said: “What this has shown is that we can work really closely with the French. There is a common shared military culture and common standards. They’re an extremely professional army and we benefit a great deal from working with them, and probably the same is true of them with us. Once validated, following Exercise Griffin Strike 16, the CJEF will be able to deploy rapidly on UK/French operations for NATO, EU, UN or coalition missions.